Colin Malone has called for greater focus from his Lurgan Celtic players in the aftermath of Saturday’s derby rout away to Armagh City. 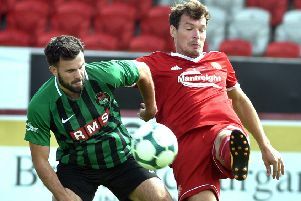 The 6-0 reverse across NIFL Championship One proved a setback in the progress of newly-promoted Celtic. Although Malone is keen to move on, he accepts the weekend defeat proved the culmination of on-going issues which must be eradicated. “It was a terrible performance and embarrassing afternoon for everyone, really just a gutless display,” said Malone, a former Armagh City manager. “Credit to Armagh as they set about us and closed down the space. “However, we just didn’t turn up and I feel especially sorry for the supporters who made the trip. “It was a case of walking head down after the match. “The concern from my viewpoint was how we lacked urgency and it didn’t help that, not for the first time, some players turned up late. “We do not ask for much and turning up at the correct time helps everyone prepare in the right way. Malone has confirmed plans to highlight his concerns this week at training - but also move on to the next match as quickly as possible. “That behaviour should not happen at Irish League level and as manager we will look at ways of eradicating the problem,” he said. “Training gives us the opportunity to make those points and we have to deal with it but also do not want to dwell on the situation. “Larne will provide a tough test, with both teams coming off the back of bad results last weekend. Celtic will play host to Larne on Saturday at 2 o’clock.